Cape Cod holds a special allure in the late fall. The quieter time on the streets, on the beach, and in the shops and restaurants is often just what is needed before the mad rush of the Christmas Holiday season begins. Make your reservation now for the Thanksgiving holiday here at Isaiah Jones Homestead. Relax and “chill” for a few days. During Thanksgiving Week there are some fun, interesting, and informative events planned here in the oldest town on the Cape. On Wednesday, November 21, 2018, enjoy the last “Talk of the Town Speaker Series” presentation for this year. During this event, held at the Sandwich Glass Museum, Henry Beston’s book The Outermost House will be discussed by Don Wilding. Mr. Wilding is a well-known historian and author who specializes in Cape Cod lore. He researched the topic deeply for his book, Henry Beston’s Cape Cod. In the presentation, Mr. Wilder will discuss how Henry Beston was extremely influential in having Cape Cod designated as a National Seashore. We will be serving breakfast on Thanksgiving Day but for the main meal of the day, we can suggest a few local restaurants that will serve turkey and all the fixins’. The Belfry Inn & Bistro is one of favorite restaurants in Sandwich. Chef Suraj (Sonny) Chopra prepares fabulous dishes that are served in the beautiful, historic setting of a 1901 church building! 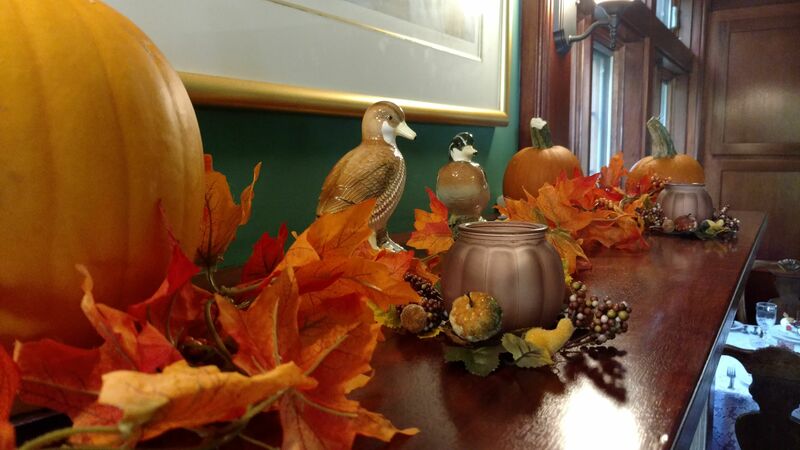 Thanksgiving Dinner at the Belfry will be served from 11:00am to 5:00pm. The three course meal will include some creative dishes such as fennel and apple salad and maple butter whipped potatoes in addition to the traditional roasted turkey. The Bistro is located literally right around the corner from the Isaiah Jones Homestead so you can leave your car at the B&B and just enjoy a short 3-minute walk to Thanksgiving Dinner. The chefs at the Dan’l Webster Inn will be serving a “fabulous harvest feast combining holiday traditions with contemporary cuisine”. They are taking reservations for seating from 11:30am to 6:30pm. We are located an easy 3 minute walk from this fabulous feast – perfect for you to build your appetite and for allowing your food to “settle” after the holiday meal. In nearby North Falmouth, MA, Sea Crest Beach Hotel can provide a view of the ocean while you enjoy their Thanksgiving Buffet. Some of the hot stations include cider glazed turkey (with Cape Cranberry sauce), Bone-in Virginia Baked Ham, and Thyme, Sage Marinated East Coast Salmon, an array of hot vegetables, rolls and cornbread. Cold stations include toasted quinoa and kale salad, pumpkin ale poached shrimp cocktail, and selections of salads and cheeses. And of course desserts are included with choices varying from traditional pies to cranberry apple cobbler and cupcakes. Of course when Thanksgiving Day comes to an end, Christmas lights begin! The Heritage Museum and Gardens will begin their “Gardens Aglow” celebration of lights on Friday, November 23rd, 2018. This event is more than just a light display! Enjoy a live performance, meet Santa Claus, check-out the model train display, and see ice sculptures. The lights are on and the entertainment happens from 4:30pm to 8:30pm on Fridays, Saturdays, and Sundays from November 23 through December 30th. Make your reservation now and be Thankful for a wonderful getaway to Sandwich, MA and the Isaiah Jones Homestead B&B. This entry was posted in Food, Holidays, Museums, Uncategorized by admin. Bookmark the permalink.